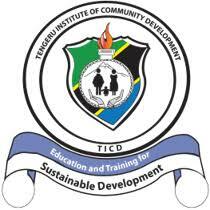 Tengeru Institute of Community Development (TICD) formally known as Community Development Training Institute (CDTI Tengeru), is an autonomous public Institution established as a body corporate by the TICD (Establishment) Order 2013. The Establishment Order was operationalized by Parliamentary Resolution No. 1 of 2014. The Institute serves as a practical-oriented professional center for demand-driven training, research, and consultancy services in the fields of Community Development, Gender and Development and Participatory Project Planning. Applications are invited from suitable qualified and experienced Tanzanians to fill the following vacant positions at the Tengeru Institute of Community Development. (TICD). x. To coach junior teaching staff. xi. To perform any other official duties assigned by relevant authorities. An attractive remuneration package will be offered to successful candidates PHTS 3/1. viii. Performs any other duties and responsibilities assigned by supervisor. Applicant must be a holder of Bachelor Degree and Master’s Degree in Gender Studies or Gender and Development from a recognized Institution. All Applicants must have a GPA of 3.5 or above on their Bachelor Degree and GPA of 3.8 or above for Master’s Degree. viii. Performs any other duties and responsibilities assigned by the supervisor. above on their Bachelor Degree and GPA of 3.8 or above for Master’s Degree. vi. To perform any other duties as assigned by Supervisor. Applicant must be a holder of Bachelor of Degree majoring in Accountancy from a recognized Institution. All Applicants must have a GPA of 3.5 or above on their Bachelor Degree. i. Assists in keeping proper records of all examinations results, minutes and regulations. ii. Assists in arranging the preparation and moderation of examination papers in accordance with the Institute regulations. iii. Ensures examinations papers and materials are handled with utmost security. iv. Assist to plan for and prepare examinations timetable for all the production of all approved examinations. v. Assists in preparing and disseminations examinations rules and regulations to students before sitting for examinations. vi. Issuance of academic transcripts and academic certificates to graduates. vii. Assists in verification of academic transcripts and academic certificates. viii. Assists in handling students complains concerning examinations and examinations timetables. ix. Assists in coordination of production of examinations. x. Performs any other duties assigned by superior. vi. Assist in ordering books and periodicals. vii. To perform any other official duties assigned by relevant authorities. recognized by the government of Tanzania.